Do they know they could be having more fun on a bike? For only $1,000 you can go 20 miles at 15 MPH! This entry was posted in Not quite a bicycle on September 10, 2014 by Gary. 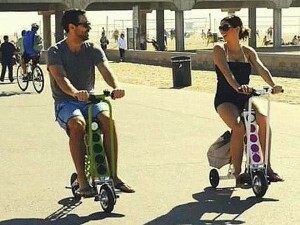 This is what young hipsters ride before they get fat enough to graduate to a Rascal scooter. 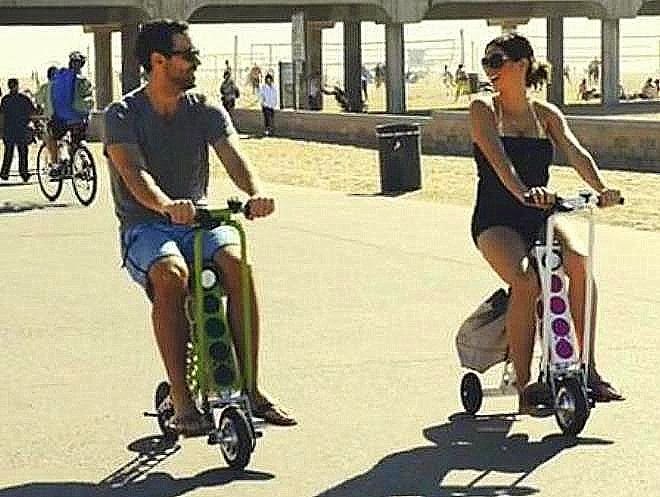 Besides the name, which is id-E-otic, I think their worst sin is advertising the scooter by showing a hip, young couple riding them by the beach. I agree with you, Gary, and can’t imagine any scenario in which scooters would be better suited for such a trip than bicycles. But for commuters who live a couple of miles from a rail station, this could be a reasonable way to get to the train in the morning. It depends largely on what you do with the scooter when you get to work. If they don’t let it inside, and there’s no good place to lock it outside, the scooter doesn’t help.